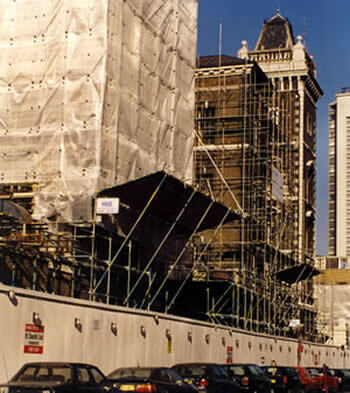 We only use competent scaffolders (CISRS) to erect and dismantle scaffold structures. Our teams are made up from experienced scaffolders at Advanced or Basic levels. The team may have a Trainee Scaffolder attached who assists with the work under the supervision of the qualified scaffolders. During the erection or dismantling process the operatives are closely supervised by our very experienced foreman and supervisors. Our scaffold structures are constructed to EN ISO 12811/1. Where appropriate design drawings or sketches are produced and the supervisors ensure these structures are constructed in accordance with the drawings etc. Our clients are always consulted at an early stage and informed of how we are going to construct their scaffold. We take into account all special requests and the general requirements of the client. Our Company is very experienced in constructing scaffolding for the removal of asbestos materials. All of the operatives used on these projects have been specially trained and hold current training certificates and face-fit tests for their face masks, along with medical certificates. It doesn't matter how complicated a structure may be, we can design and construct a scaffold that will suit the clients requirements. We have an enormous range of experience to call on and have worked in just about every environment. A copy of our Insurance Certificate and a letter from our Insurance Broker is available on request.